You Save: $14.96 (75%) Ships in 1 day. Hard Cover, 319 pages, 4.75 x 7.50. If you thought real ale was only available on draught in a pub, think again! The Campaign for Real Ale's acclaimed Good Bottled Beer Guide places the spotlight on nearly 800 British bottle-conditioned beers, celebrating and cataloguing the UK's ongoing bottled beer revival. 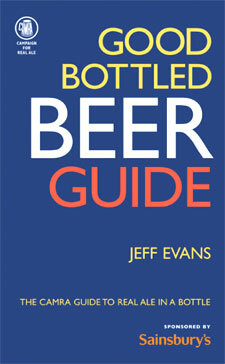 It is a pocket companion to the CAMRA's best-selling Good Beer Guide. Bottle-conditioned beer is real ale in a bottle. Just like draught beer that has been allowed to mature naturally in the cask at the pub, it has a full, fresh taste, without the un-natural fizz of artificial carbonation or the dead hand of pasteurization. The phenomenal growth in the bottle-conditioned beer market - in supermarkets, in beer shops and via the internet - is continuing at an exciting pace. This handy pocket guide, now in its sixth edition, is fully revised and updated to guide you through the process of choosing, tasting and enjoying the right beer for the right occasion. Beer that ferments naturally in the bottle has a complex, fresher taste, just like draught ale that has been allowed to mature in the cask at the pub. This award-winning book is the perfect companion for every armchair beer lover.